Roy Lichtenstein was an American artist known for his paintings and prints which referenced commercial art and popular culture icons like Mickey Mouse. Composed using Ben-Day dots—the method used by newspapers and comic strips to denote gradients and texture—Roy Lichtenstein’s work mimicked the mechanical technique with his own hand on a much larger scale. Roy Lichtenstein was a leading figure in establishing the Pop Art movement, along with Andy Warhol, James Rosenquist and Jasper Johns. “I take a cliché and try to organize its forms to make it monumental. The difference is often not great, but it is crucial,” Roy Lichtenstein once said of his work. Our Fine Art Gallery has the finest quality Roy Lichtenstein original prints, lithograph and signed screenprints. We have a large inventory available off-site and we encourage you to make an appointment to see specific works you are looking to collect. We are happy to meet you at either our art gallery showroom or at your home or office for a private presentation. American Pop Artist Roy Lichtenstein was born in New York City on October 27, 1923, the son of Milton and Beatrice Werner Lichtenstein. Roy Lichtenstein’s father worked as a real estate broker and his mother was a homemaker and gifted piano player. Roy Lichtenstein attended public school until the age of 12, and then enrolled at Manhattan’s Franklin School for Boys, remaining there for his secondary education. Roy Lichtenstein grew up under no specific artistic influence – neither at home nor at school. But by the age of 14 Roy Lichtenstein attended a Saturday morning painting class at Parson’s School of Design, and in 1939 Lichtenstein enrolled in summer classes at the Art Students League in New York. Roy Lichtenstein then left New York to study Fine Art at the Ohio State University, which offered studio courses and a degree in fine art. In 1943 Lichtenstein’s Art education was interrupted by three years of army service, during which Lichtenstein drew up maps for planned troop movements across Germany during World War II. Roy Lichtenstein returned home to visit his dying father and was discharged from the army under the G.I. Bill. Lichtenstein returned to studies in Ohio under the supervision of his teacher, Hoyt L. Sherman, and Roy Lichtenstein received his Bachelor of Fine Arts degree from Ohio State University in 1946 and Master of Fine Arts degree in 1949. In 1951 Roy Lichtenstein had his first one-man art exhibition at the Carlebach Gallery in New York. That same year Roy Lichtenstein moved to Cleveland, where he would remain for six years, although Lichtenstein frequently traveled back to New York. During this time Roy Lichtenstein undertook jobs as an engineering draftsman to support his growing family. Roy Lichtenstein’s art at this time fluctuated between Cubism and Expressionism. In 1957 Roy Lichtenstein moved back to upstate New York, taking teaching positions at New York State University and then Rutgers University in the early 1960s. During this time Roy Lichtenstein would meet artists Jim Dine, Claes Oldenburg and George Segal who were experimenting with different kinds of art based on everyday life—known as Pop Art. In 1961 Lichtenstein began his first pop art paintings using cartoon images and techniques derived from the appearance of commercial printing. This phase would continue until 1965, and included the use of advertising imagery suggesting consumerism and homemaking. Roy Lichtenstein’s first pop art painting featured the iconic image of Mickey Mouse. In the same year, Lichtenstein produced six other pop art paintings with recognizable characters from gum wrappers and cartoons. In 1961 Roy Lichtenstein visited Andy Warhol at the Factory where he saw Warhol’s comic strip and consumer goods paintings. That same year Art Dealer Leo Castelli started displaying Lichtenstein’s artwork at his gallery in New York. Roy Lichtenstein had his first one-man show at the Castelli Art gallery in 1962. Through Leo Castelli, Roy Lichtenstein would be introduced to fellow Pop Art successes like Robert Rauschenberg and Jasper Johns, and would eventually show with Pop Artists like Jim Dine, among others. Like other Pop Artists, Roy Lichtenstein adopted the images of commercial art but in a highly distinctive and stylized manner. Inspired by comic strips, Roy Lichtenstein worked on a massive scale using stencils which produced rows of dots (benday dots) making the works look mass produced. One of Lichtenstein’s peculiarities was that he did not want his brushstrokes visible—intentionally making the work look machine made. It was at this time, that Roy Lichtenstein began to find fame not just in America but worldwide. 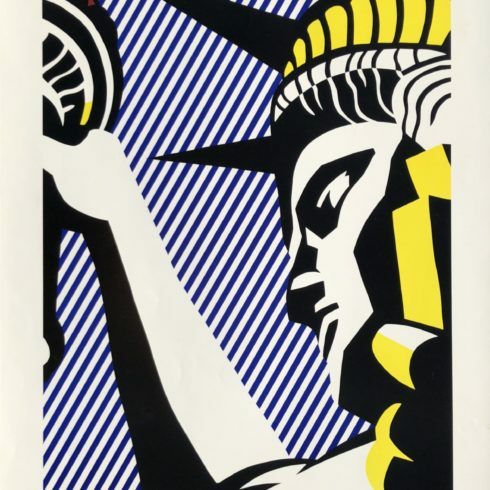 Lichtenstein moved back to New York City to be at the center of the art scene and resigned from Rutgers University in 1964 to concentrate on his art. In 1963 Roy Lichtenstein created his iconic imagery of D.C. Comics’ Girls’ Romances including one of Lichtenstein’s best-known artworks, Drowning Girl (1963), which was appropriated from the lead story in DC Comics’ Secret Hearts #83. (Roy Lichtenstein’s Drowning Girl now hangs in the Museum of Modern Art, New York. Roy Lichtenstein produced a number of graphic prints for which he used different techniques: lithographs, screen prints, etchings, and woodcuts, sometimes combining multiple techniques in one print. In 1994 a Roy Lichtenstein Print retrospective opened at the National Gallery of Art in Washington, D.C. and later traveled to the Los Angeles County Museum of Art and to the Dallas Art Museum. The show coincided with the release of ‘The Prints of Roy Lichtenstein: A Catalogue Raisonne’ by Mary Lee Corlett. 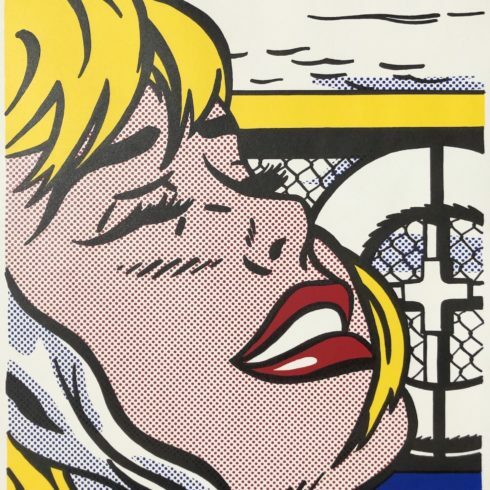 The National Gallery in Washington, D.C. would become the largest repository of Roy Lichtenstein’s prints when the artist gifted 154 prints from 1948-1993 and two books to the institution. 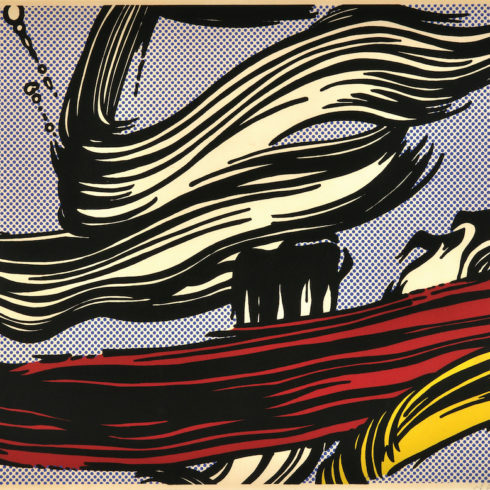 Roy Lichtenstein died of pneumonia on September 29, 1997, at New York University Medical Center.